So this afternoon’s astronomy seminar was by a guest speaker, Mike Edmunds of Cardiff University, on what I can honestly say is the most fascinating artefact from the ancient world ever discovered. 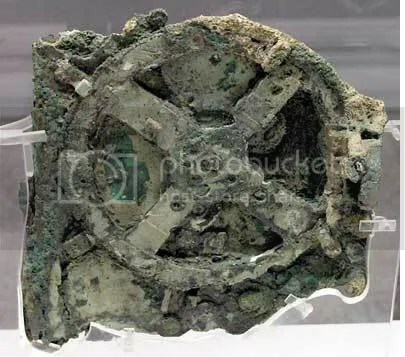 The Antikythera Mechanism, as it’s been dubbed, dates back to the 2nd Century BC in Ancient Greece. It’s estimated to be over 2140 years old, and is the most complex piece of geared machinery from that time. This is especially remarkable, as similarly complex mechanisms wouldn’t be created anywhere else in the world for at least 1000 years. Indeed, until this artefact was discovered, no one even know the Ancient Greeks knew how to make geared machinery! It’s believed to have come from the island of Rhodes, which was home in ancient times to the best engineers and astronomers the greeks had to offer. Discovered in a roman shipwreck, the machine must have been either bought or plundered, and despite the damage incurred by sitting underneath the Meditterranean sea for two millenia, it’s probably the only reason it survived until it’s discovery at the beginning of the 20th century. The machine’s casing is also inscribed with a lot of writing (still only partially transcribed) explaining it’s use. It’s a calculator which would have been used to determine the positions of the Sun and Moon (and the lunar phases) at any given time. The gears in this machine would have taken a remarkable amount of skill to create. The large gear visible in the picture has 53 teeth. A prime number. Just try drawing that, with equilateral triangles as teeth – it’s no trivial feat. Furthermore, as well as being beautifully crafted, the gears were carefully made to correspond to various astronomical cycles of the Sun and the Moon. It’s believed that other (now lost) parts of the machine might have corresponded to the planets too. One of the true wow factors in this though, is how gears are carefully aligned to compensate for the fact that the Moon has an elliptical orbit – even though the greeks actually had no concept of elliptical orbits (which weren’t even considered until Kepler devised his laws of planetary motion in the late 14th century AD). The apparent retrograde motions of the Moon with respect to the Sun were also accounted for. 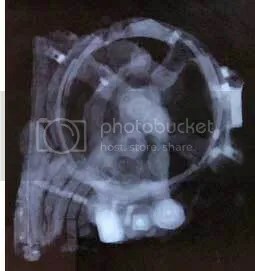 The concept of creating this device is just mind boggling, and it shows that the ancients were much more advanced than we give them credit for. It’s just a pity that no astronomical records from before Ptolemy still exist. There must have been more of these mechanisms. It’s simply far too complicated to have been a prototype. It seems, as well, that some incomplete reconstructions have been made of it, too. This entry was posted in astronomy, Imported from Livejournal and tagged archaeoastronomy. Bookmark the permalink.